The approximately 15,500 acre Shingle Shanty Preserve is located at the top of three watersheds in a remote part of the Adirondack Park, approximately 9 miles west of Long Lake, NY. — Roland Kays, Ph.D., Research Associate Professor and Director, Biodiversity & Earth Observation Lab, Nature Research Center, North Carolina Museum of Natural Sciences. The over 23 square miles (60.7 kilometer square) of the Shingle Shanty Preserve is located at the top of three watersheds in a remote part of the Adirondack Park, approximately 9 miles west of Long Lake, NY. Shingle Shanty Preserve is just 3 hours from Albany, less than 4 hours from Montreal, and less than 6 hours from New York and Boston. While we’re easy to get to, once you arrive you’ll realize how isolated we are. The vast landscape takes hours to cross, even in a vehicle. 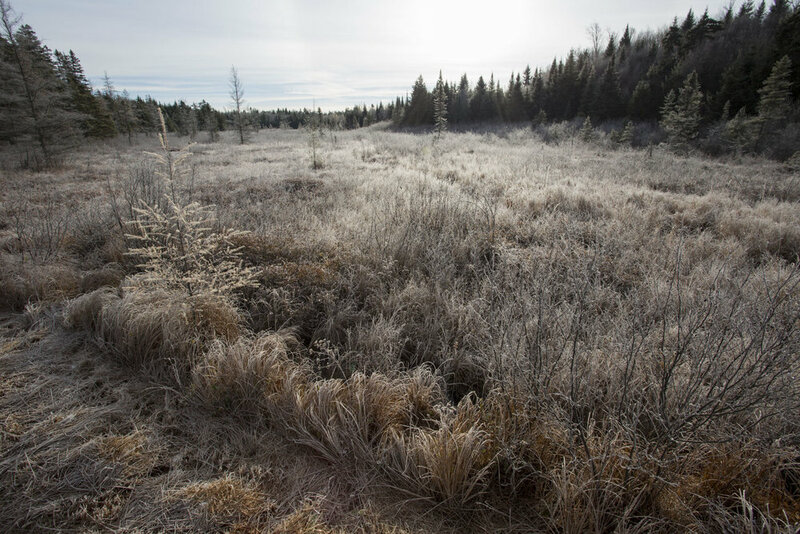 And while the property, which includes nine lakes and ponds and over 12,500 acres of hardwood forests, is undoubtedly a gem, it’s our 2,000 acres of boreal peatlands that make us an unparalleled resource in the Northeast. Dozens of plants and animals native to northern North America survive and thrive here, a place that places them at the edge of their climatic tolerance. Wetlands like these are invaluable to regional biodiversity. Seven remote ponds that host breeding loon and waterfowl populations. Ecological communities recognized as exemplary by the New York Natural Heritage Program including Dwarf Shrub Bogs, Black Spruce, Tamarack Bogs, Marsh Headwater Streams, Shrub Swamps and a single oligotrophic pond. Nine of the ten miles of the Shingle Shanty Stream are contained within its borders. Over 100 oxbows define this waterway before draining into Lake Lila. Over 40 miles of headwater streams feeding the Beaver and Moose River watersheds. Well documented animal and plant species, of which 12 are rare bird species including the Spruce Grouse, Bald Eagle, Osprey, American Bittern and numerous hawks. 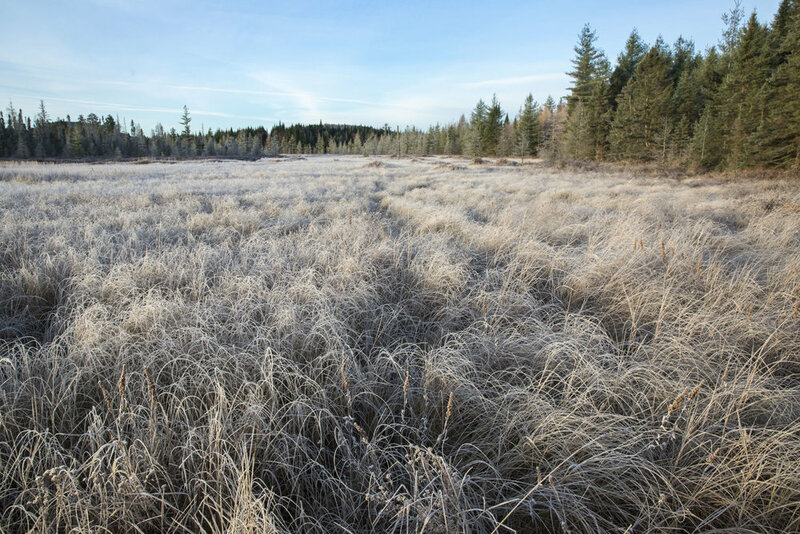 Arguably, the most exceptional feature of the Preserve are the extensive peatlands, which began forming after the retreat of the Holocene glacier approximately 10,000 years ago. Large boreal peatland complexes are at the southern extent of their range in the Adirondacks, and contain species not found in other habitats, including a number of declining boreal bird species. The Preserve has a network of logging roads that was created when the property was owned by International Paper. Shingle Shanty Pond, South Pond, Deer Pond and Thayer Lake are all easily accessible via road. The Preserve receives limited and highly restricted usage. Those with access to the property are particularly concerned about the introduction of invasive species and are subject to a number of rules to prevent the accidental introduction of aquatic and terrestrial invasive species. Limited access and tight restrictions on the use of internal combustion engines means that the Preserve is exceptionally silent when it comes to human noise. Researchers making audio recordings don't need to worry about contending with the din of distant motorboats, passing vehicles, dogs barking, or conversations drifting across water or through the woods. While it is certainly possible to find similarly quiet areas in the Northeast, it typically requires long treks away from vehicles. The Preserve is located in one of the darkest areas in the Northeast, making it a fantastic location for astronomy education or any other educational or research activity that would benefit from minimal light pollution. In terms of climate and ecology, the Preserve has a lot more in common with regions hundreds of miles to the north than the immediately surrounding area. The Preserve is located in an unusually cold area for its latitude in the southernmost area of USDA hardiness Zone 3 in the northeastern United States. Species common 50 miles away, such as oaks, are not present in the area. Changes in species composition resulting from climate change are likely to occur much more rapidly in ecologically isolated areas.